No. 3 Hut (16 beds in 2 rooms, wood-burning stove, tank/creek water) is a lovely historic hut on flats in the mid reaches of the Hurunui River. The hut is well built and lined with macrocarpa timber. Harper Pass was the standard route to the Westland goldfields until Arthur's Pass opened in 1865. The route was neglected until 1938 when the Department of Internal Affairs attempted to promote it as a recreational walk, with the lofty goal of rivalling the Milford Track. 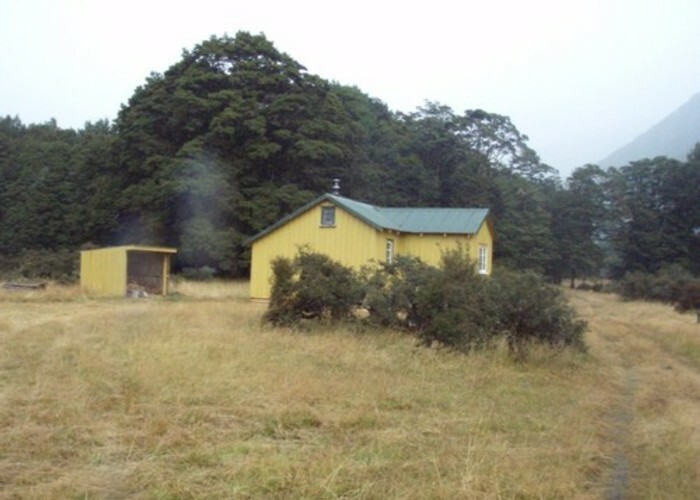 Five numbered huts were built along the route at Lake Taylor, Hurunui River, the head of the Taramakau, and near Toms Creek. Only Nos. 3 and 4 remain, although No. 1 Hut has been shifted to The Lakes Station. When constructed, the side room was intended as exclusive space for women! No. 3 Hut / Number Three hut • By madpom. Licence: cc by. Hurunui Hut / Lake Sumner Roadend: 9km (2.5 - 4 hours) to Hut. Valley floor track / well maintained cut track in bush sections. Roadend 2km (30 mins) beyond hut. Added 25 September 2005 by MatthewMatthew. 3 revisions, most recently 29 October 2014 by HonoraHonora.